Talking about lifestyle pickup trucks and not inviting Ford to the party is a sin. One of the most successful pickups in the world, the Ford Ranger is very much in news for all the right reasons. In April, Ford did launch the 2.2-litre Wildtrak version of the Ranger. For all those who don’t know, the Wildtrak variant is a more sinister looking version of the standard Ranger. The visual differences include blackened out parts and components like front grille, alloy wheels front and rear bumpers, rear view mirrors, and bed rails. Apart from it, the Wildtrak also gets premium leather upholstery with orange stitching and additional equipment like Adaptive Cruise Control, Lane Departure Warning, Lane Keeping Aid, six airbags, and Forward Collision Alert, over the regular top-end XLT trim. Have a question on Ranger? Ranger is available in 6 different colors - Yellow, Absolute Black, Lighting Blue, Frozen White, Aluminium Metallic and Magnetic. 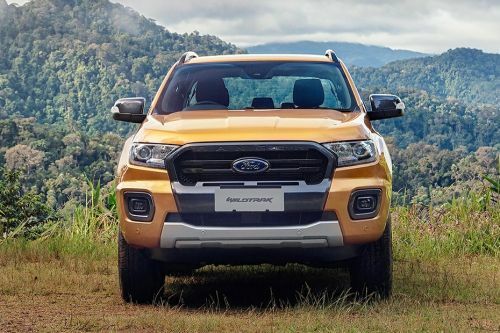 The Ford Ranger has been serving the Malaysian market for quite some time now. And from what we know along with the sales data support, the Ranger has done a pretty good job. However, the last-gen Ranger seemed to lose its market grip to the dated design and not-so-modern feature list. It is to be noted that in 2015 the Ranger received an update, with revisions only limited to under the hood configuration. The all-new 2019 Ranger reveal didn’t came-in as a surprise. The updated pickup was already on a launching spree. Also, with the neighboring countries receiving their share, there was no chance of Malaysia skipping the routine. Moving on, the Malaysian-spec Ranger 2019 is launched in five trims in total, out of which the Raptor is yet to go on sale. The remaining four are categorised as High Rider units, included in the list are - XL, XLT, XLT+, and Wildtrack. The new Ford Ranger is launched with two distinct engine options. The XL and XLT trim runs on a 2.2-litre TDCi VGT Puma mill. The XLT+ and Wildtrack variants, on the other hand, gets a 2.0-litre engine. Ford has introduced many first-time features in the Ranger pickup one of which is the 10-speed automatic transmission unit with SelectShift. As for the comfort, luxury, and safety features, the 2019 Ranger has all of it in abundance. The updated Ranger price starts from RM 90,888 and goes all the way to RM 144,888. The Ranger is available in many color options with each variant getting a specific set of splashes. It’s not wrong to say that the cabin of the new Ranger like the exterior has undergone a sea of changes. For someone only seeing the interior with no knowledge of the exterior profile can easily mistake the Ranger for any of Ford’s high-end car. Such is the quality, fit and finish of the vehicle. Though all the variants differ slightly from one another in terms of amenities on offer, however, what remains common is the attention given to space, functionality, and comfort. The controls are easy to reach and are in plain sight. The seats are ultra comforting and positioned in a manner to give extra legroom. Getting in and out is simple, even in the double cab trim that gets massive doors and smartly placed rear pillar. Also, the noise, vibration, and harshness levels have been lowered without compromising on the towing or payload capacity. For entertainment and connectivity is present an 8-inch touchscreen display. It sits right at the centre of the dashboard and supports Bluetooth, voice recognition, and navigation functionalities. It also comes with swipe and pinch-zoom feature, included in the package are 2 USB and 6 (2 to 4 in lower trims) speakers. The new Ranger comes with the upgraded SYNC3 system that now can understand over 10000 natural voice commands. Passengers can use their favorite app on the go via Apple CarPlay, Android Auto, and AppLink. While the XTL+ variants and above offers Dual-zone automatic climate control, leather seats, keyless entry with push-start button, Ford MyKey, cooled centre console, and dual four-inch instrument panel. The standard offering includes single-fabric manually adjustable seats and an audio unit with USB. The Wildtrack package justifies its higher price tag with add-ons like GPS Navigation, eight-way power adjustable driver’s seat, and 230V AC outlet. Pardon us, if we forgot to mention that the new Ranger carries the perfect look that is good enough to give any pickup run for its money. Ford designers have done a commendable job, especially with the front part. The enormous black (chrome in XLT and radiator in Wildtrack) grille steals the show. Also, the wide bonnet, extended side profile along with the sort after rear, seals the deal. However, the different trims have something that separates one from another. Like, while the XL variant - both Single Cab Manual and Double Cab Manual/Automatic run on 16-inch alloy wheels the rest get 17-inch units. Also, the halogen reflector headlights with manual leveling in the former are replaced by automatic lamps in remaining trims. The 1180 mm cargo bay gets LED lights as standard they provide extra illumination while loading and unloading. In terms of dimensions, all Ranger trim measures 5426 mm x 1860 mm x 1,848 mm in length, width, and height respectively. The ground clearance and wheelbase are massive at 237 mm and 3220 mm, respectively. The new 2019 Ford Ranger uses double wishbone with coil spring and leaf spring suspensions at the front and rear respectively. On the braking front, the Ranger comes fitted with the ventilated disc at the front and drums at the back. Enhancing Ranger’s ride quality and NVH level is an ultra-high-strength steel chassis that perfectly compliments the suspension setup and contributes towards improved handling. With the 4X4 Shift-On-The-Fly setup, one can effortlessly move between 2WD and 4WD high/low mode. There’s no doubt that the Ranger is a capable pickup, the company claims an 800 mm water wading capacity. Water or dry land, the Ranger rules all. Further, it has an approach angle of 29.4 degrees, rampover of 21.5 degrees, and 22 degrees of departure. The 2019 Ranger is offered in two engine options in the Malaysian market. The XL and XLT trims are powered by the bigger 2.2-litre inline-four with Variable Geometry Turbo engine. This mill produces 160 PS at 3,200 rpm of power along with a peak torque of 385 Nm at 1,600-2,600 rpm. The XLT+ and Wildtrak 4x2 automatic variants run on a 2.0-litre Si-turbo inline-four diesel engine with VGT. The power and torque figure for this one reads 180 PS at 3,500 rpm and 420 Nm at 1,750 - 2,500 rpm, respectively. And the last and the most potent mill is taken by the Wildtrak 4x4 Automatic. It gets the same 2.0-litre mill but with the added benefit of bi-turbo. It thus churns out 213 PS of maximum power at 3,750 rpm and 500 Nm at 1,750 - 2,000 rpm of peak torque. Coming to the transmission part, the new Ranger is available in both manual and automatic options (depending upon on the variant). The 6-speed transmission unit does the manual duty. On the automatic front are present 6R80 6-speed (XL Double Cab and XLT Auto) and 10R80 10-speed automatic units (+XLT, 4x2 Wildtrack, and 4X4 Wildtrack). The 2019 Ford Ranger specs sheet points towards an extended safety list. Ford has given the following features as standard - dual airbag, ABS with EBD, Electronic Brake Assist, Electronic Stability Control, Hill Descent Control, Hill Launch Assist, Rollover Mitigation, Trailer Sway Control, Adaptive Load Control, ISOFIX child seat mounts. Parking the Ranger Wildtrack is a no-brainer since it comes with a reverse camera, rear parking sensors, and Semi-Automatic Parallel Parking. The all-new Ford Ranger is no regular pickup. The right word for it would be a 'lifestyle pickup' that not only caters day-to-day chores but at the same time fulfills all luxury needs. And we are pretty sure, its competitors like the Toyota Hilux, Isuzu D-Max, Nissan Navara, and Mazda BT-50 needs to catch up soon with the update. Overall, Ford has done a great job with the new Ranger. The pickup looks excellent, it drives like a dream, and the safety specs are unavailable. What are the Safety Features Available in Ford Ranger?